Every year at the end of tomato season I make this tomato ragout. It is the best tomato ragout (sauce) that I can get from anywhere and my family has been making it like this for decades. Usually I make a few large batches and they get me through most of the year, and if I run out, I just make it with canned tomatoes. It is not as good though. Good, but not the same. 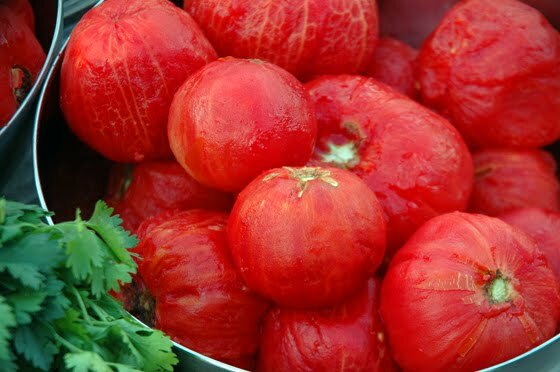 If you are working with fresh ripe tomatoes, you will want to put them in boiling water for just a few minutes, to peel them easier. Just a few minutes should do it, and if you are using canned tomatoes, obviously, you can skip this step. Once you have them peeled you will remove the core and quarter them and then half the quarters. Don't lose any juice, put it all in the bowl and you will add it all to the pot later. Use a very big pot for this, so all the ingredients reach to the middle of it or bellow, because tomatoes like to make a mess when you cook them, cleanup is easier later, and it is easier on your hands when you are stirring too. This is the ratio I usually use. First of all, I use good olive oil, it makes a difference, so if you have it, use it. 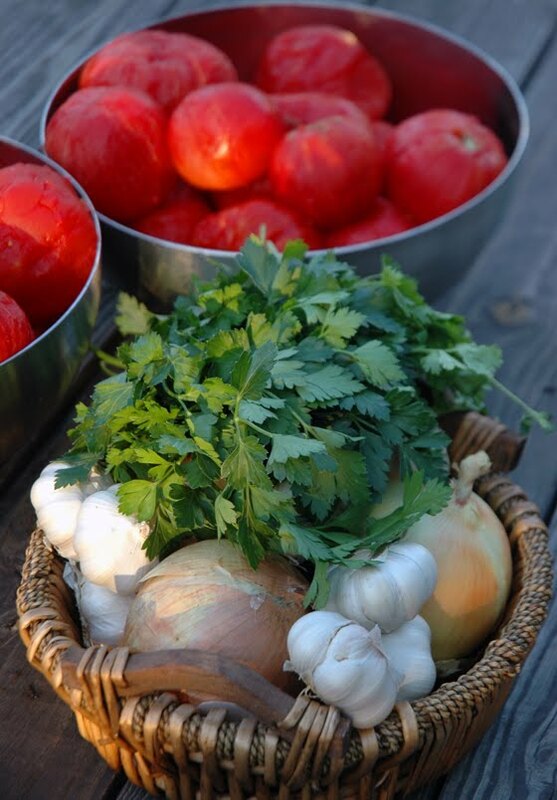 For 2lbs tomatoes I use 1 onion, 2 cloves of garlic and about 4 Tbsp of chopped parsley. Also you would use about 2 Tbsp of olive oil, 1/4 tsp of pepper and 1 tsp of salt and a teaspoon or two of sugar. I am just trying to gestimate the seasoning right now, truth is, you will have to try it and season it to taste. Saute onions in olive oil until translucent and then add garlic for a minute or two*. Add the tomatoes in. It will splatter a bit because of all the juices from the tomatoes so be careful, it only lasts a few seconds. Stir and season and cook for 30 minutes or so. Add parsley and check again for seasonings. Cook for another 15 to 30 minutes and then you can use a potato masher to make a nice thick ragout with some chunks, or use a hand held mixer. I prefer using the potato masher and having some chunks in mine, which is also achievable with the hand held mixer, I guess it's just what you are more comfortable with. After this I usually fill up a mason jar or two with the sauce and that goes in the fridge for the spaghetti that night or the next day, and my husband also loves to dip chips in it like it's salsa, so I save some for him. Rest goes in sandwich size zip lock baggies. That is the perfect portion size for us, and off to freezer they go. *note! If you like stronger tasting garlic, don't add it with the onions at the beginning, but at the same time you add the parsley in! I use this as is for spaghetti or to use in Puttanesca sauce...I use it in other dishes too, like for a casserole dish where I layer sliced grilled eggplants with this ragout and grated cheese. Delish! It has many uses and you can't get flavor like this from the store, I guarantee you that. 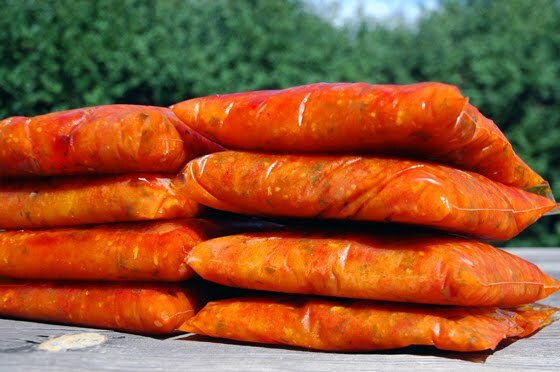 In Croatia we call this salsa, and it is very typical for Dalmatia. We even serve it as a condiment, but most often is just with plain old spaghetti and freshly grated Parmesan cheese. So good! Hi, I found your blog via Pinterest (a link to your Enchilada Lasagna) and your recipes sound simple and wonderful. Can't wait to start trying them! Your photos are beautiful, as well. Welcome and I hope you enjoy the recipes!